A space is being readied on the Advanced Manufacturing Park (AMP) in Rotherham for supercar manufacturer McLaren to build a £50m, 75,000 sq ft, carbon-fibre composites factory. The arrival of the premium UK brand will accelerate the development of the Sheffield-Rotherham Advanced Manufacturing Innovation District (AMID) and highlights the partnerships, support, training facilities and finance available to high quality inward investors. Officially announced today, McLaren, will reshore UK production​ at a new purpose-built factory in the district with a multimillion pound Composites Technology Centre responsible for the development and manufacturing of advanced carbon fibre chassis for McLaren Automotive's supercars. Years in the making and known only as "Project Mercury" the inward investment is largely down to a new partnership with the University of Sheffield Advanced Manufacturing Research Centre (AMRC) with Boeing and is backed by a grant of up to £12m via the Sheffield city region (SCR). It is another major name in the emerging AMID idea for the Sheffield-Rotherham corridor, where the aim is to develop Europe's largest research-led advanced manufacturing cluster. The latest deal will create more than 200 jobs through a combined investment of nearly £50m. The investment is set to have a £100m of GVA (gross value added) benefit to the local economy by 2028. The new McLaren Automotive facility is due to start construction in early 2017 with the first pre-production carbon fibre chassis, built using trial manufacturing processes in the AMRC, expected to be delivered to the McLaren Technology Centre in the second half of 2017. Full production at the facility will begin by 2020. Mike Flewitt, chief executive officer of McLaren Automotive, said: "In 1981, McLaren was the first company to recognise the exceptional properties of carbon fibre, and we have designed the highly-technical material to be at the heart of every McLaren road and racing car ever since. "The now-iconic McLaren F1 was the world's first road car to be built with a carbon fibre chassis and every car built more recently by McLaren Automotive has the same. Creating a facility where we can manufacture our own carbon fibre chassis structures is therefore a logical next step." Last year, McLaren announced its Track22 plan which includes an investment of £1 billion into R&D over the coming six years, leading to the launch of 15 all-new cars or derivatives. Flewitt added: "We evaluated several options to achieve this objective but the opportunity created by the AMRC at the University of Sheffield was compelling. At the AMRC, we will have access to some of the world's finest composites and materials research capabilities, and I look forward to building a world-class facility and talented team at the new McLaren Composites Technology Centre." 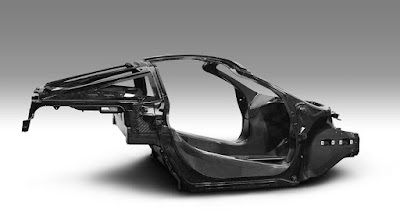 McLaren Automotive and the University of Sheffield will deliver a two-year research and development programme, which will lead to the development of a production facility to build its lightweight carbon fibre chassis for its new models from 2020. The University of Sheffield's AMRC Training Centre, on the AMP in Rotherham, will also immediately start training McLaren apprentices who will work in the new facility. Professor Keith Ridgway, Executive Dean at the AMRC, said: "This is a tremendous piece of news for the Sheffield City Region and a boost for its future as the UK's centre for advanced manufacturing. "In many respects it represents a new model that repositions manufacturing in Sheffield, taking it on from coal and steel to high performance components for the automotive, as well as the aerospace, sector. "We will be working with McLaren Automotive on the construction of the carbon fibre chassis and further research, and we are talking with the supply chain. It is our ambition that supply chain companies will start to build factories here to supply the chassis plant." The AMRC already operates a Composite Centre on the AMP in Rotherham, extending the AMRC's expertise in metals production into the new generation of carbon fibre composite materials. The McLaren investment is linked to the AMRC's £31m AMRC Lightweighting Centre, which recently secured a £10m grant from the Sheffield City Region. The 8,000 sq ft centre will be part of the new AMRC Campus on the site of the former Sheffield Airport and will support the manufacturing and research of lightweighting structures and materials. It is set to house a 300 tonne hydraulic press and associated equipment and other experimental equipment.